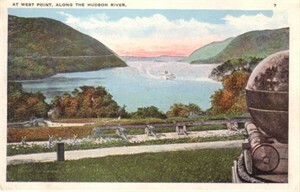 Original vintage color postcard showing West Point Along the Hudson River. Published by J. Ruben in Newburgh, NY. Undated but perhaps from the 1920s based on the style and steamboat pictured. Unused, has minor to moderate corner wear. ONLY ONE AVAILABLE FOR SALE.